The two-nation theory has had far too many ramifications than the leaders would ever have imagined. For over 60 years, both India and Pakistan have remained sworn enemies despite them sharing history and having the commonalities that their people would not find anywhere else in the world. 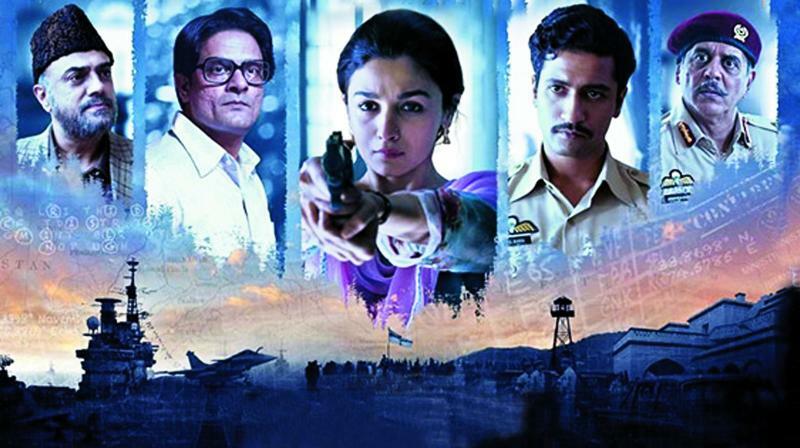 Meghna Gulzar’s Raazi, based on Harinder Sikka’s book Calling Sehmat, gives us a taut espionage thriller that doesn’t take sides, although in many ways Pakistan’s intelligence seems to be failing and the officers made to look gullible. But what Gulzar emphasises most on is citizens of both sides of the border displaying their own brand of patriotism that indicates loyalty to their nation. In turbulent times like the one we are all going through now, when one word (or, a portrait!) of praise of the enemy camp leader could trigger a belligerent reaction from both sides, her standpoint is extremely relevant. She also manages to weave many humane and emotive characteristics of real men and women into the narrative that may border on the unlikelihood of the very premise itself, but never strays into jingoistic flavour. The story takes us back to the 1971 India-Pakistan war when there is a dearth of trust on both sides, and Pakistan is hell bent upon retaining its supremacy over East Pakistan by planning a secret military operation. When good-natured wealthy businessman Hidayat (Rajit Kapur) travels to Pakistan, serving as a double agent, there is little doubt in Pakistan Brigadier Syed’s (Shishir Sharma) mind about Hidayat’s loyalty towards him. Little does Syed know that Hidayat as a true patriot and the son of a freedom fighter would not betray his homeland. Although suffering from a terminal lung tumour, he would not leave his agenda unfinished. He gets his 19-year-old daughter Sehmat (who is studying in Delhi University) married to Syed’s son — a Pakistani military officer Iqbal (Vicky Kaushal) — so that, she, in turn, could make a covert operator, and a willing conspirator in her father’s plans. She is ready to become a martyr in the line of her duty. The time is crucial as Pakistan’s plans of ensuring that East Pakistan stays in its grasp get concretised, and Sehmat would have to be trained by RAW. As Sehmat adjusts herself as the duty-bound daughter-in-law in her in-laws household, she also performs her role as the agent to perfection even as war becomes imminent between India and Pakistan. We are all aware that there is trust deficit and complete erosion of amity between the two countries. But is that all to people who are similar in their appearance, colour and cultural affinity? Gulzar tells us a story that one would either dismiss as fiction or sit up and dwell eagerly on the probability of an Indian carrying forth a secret operation only for the honour of her country. It is her conviction — coupled with Alia Bhatt’s powerhouse performance — that is bound to make viewers pleasantly surprised. There are differences too: Iqbal and Sehmat’s marriage looks like any other union, but even as the cross-cultural alliance seems natural, deception could be at the root of their very pact, which Iqbal is not aware of. Between so-called friends too — Syed and Hidayat — while religion may be the unifying factor between them, there is definite and different proclivity to show allegiance to their respective governments. A fast-paced thriller seldom offers viewers any relief to ponder over a sensitive relationship between two characters who could be dealing with a life-shattering conundrum that life suddenly throws them into, but the rapidity of the scenes doesn’t allow their gravity to come forth effectively. In Raazi, one scene that lingers on is tender awkwardness betw-een two married strangers — Sehmat and Iqbal — who have an inflexible outline of their newly-wed joys. Of course, both have distinctive plans: he of finding happiness, and, she of fulfilling her ongoing manoeuvre! Alia Bhatt internalises the alternate insecurities and uncertainties of Sehmat brilliantly, but only if there was more soundness of her actions explained one would have loved her even more. The film is not without flaws though. If Sehmat would go to any lengths to obey her father’s commands, and, is seen as an easy malleable youngster, why does she not — even once — care for her own life, and her dreams? Her mission to not question and follow her father’s exercise without so much as a feeble protest seems odd for her 19-year-old existence. Scriptwri-ters Meghna and Bhavana Iyer have also taken the liberty of wiping out a few cha-racters from her life, making her a one-goal dreamer who doesn’t care for any wrong move. Raazi boasts of some splendid performances by even those who have small roles. Topping the list is Vicky Kaushal, whose underplayed role may look underwritten, but he brings in enough heft to the character of the obligated son and citizen that he is meant to be, as also, the tormented husband beginning to fall in love with his wife in the arranged marriage. Upon discovery of his wife’s betrayal, he displays the look of helplessness as real as it gets. Shishir Sharma as Syed; Arif Zakaria as the loyal family help whose penetrating eyes pierce into Sehmat’s well-laid plans; Jaideep Ahlawat as Sehmat’s trainer Khalid Mir; Ashwath Bhatt as Mehboob Syed; Amruta Khanvilkar as Munira; and, Soni Razdan as Sehmat’s mother Teji Khan are all part of the supporting cast but each one of them leaves a mark as an individual.